U00230 - Nice paper time fuses of varying times -- you pick! Item Title: Nice paper time fuses of varying times -- you pick! Description:I have a couple dozen nice quality time fuses of varying burn times. Shown here are ones of 4, 5, 8, 10, 15, and 20 seconds. I have at least two of each of these times but I don't currently have other times. 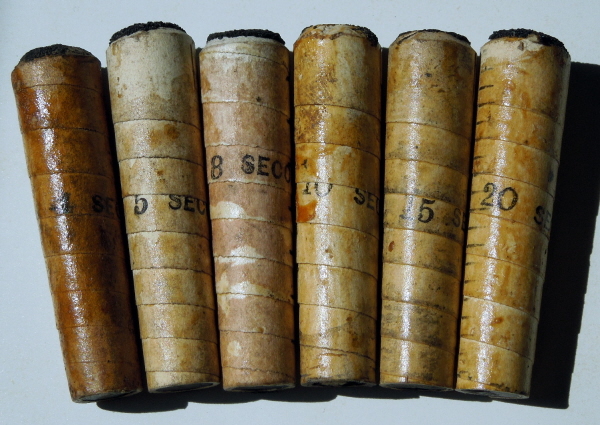 All the fuses are in nice condition with legible #s and words. You see a lot of these that are decomposed or corroded, but these are quality ones. However, when all the ones of a certain time length are sold, they are gone as I am not planning to get many more until I have worked down this inventory.